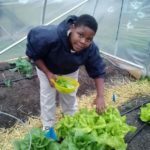 Real Food Farm welcomes middle school, high school, and college students of up to 25 to the farm to complete their service learning hours or work on a specific community service project. All groups will receive an introduction and tour of the farm, work with RFF staff to complete a project that benefits the farm, and participate in a wrap‐up session to talk about what they learned and saw during the day. Our staff can also suggest pre‐trip readings or activities to prep your group for their visit to the farm. If you are interested in working on a special project, just let us know. Teachers or school administrators should complete the online registration. Each participant must have a parent/guardian sign an individual waiver – please bring these with you on the day of your trip (anyone over 18 years old can sign their own copy at the farm). We typically schedule trips at least three weeks in advance. Service learning is generally available on weekdays from 9:00 a.m. – noon although some exceptions can be made to accommodate your group’s schedule. 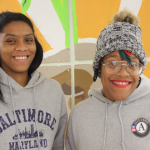 Real Food Farm’s Education Coordinator can answer any questions about service learning: rffeducation@civicworks.com. For independent learners looking for service learning opportunities, check out the farm’s open volunteer hours. There should be a minimum of one adult for every ten students. Adults include teachers, administrators, parents, and teacher aides. 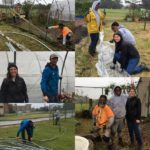 A Real Food Farm service learning project is an outdoor experience, rain or shine (except during severe weather such as lightning or heat advisories, in which case we will relocate into indoor spaces when possible until the conditions are safe). Visitors should dress appropriately for the weather and wear sturdy shoes for walking in grass and dirt paths. Visitors should also bring a water bottle. Real Food Farm will provide work gloves, water, and all necessary tools. All visitors must complete a waiver (minors need their parent/guardian’s signature). We have a sliding scale fee system. Your fee will be noted upon completion of our registration form. You are welcome to email us at rffeducation@civicworks.com with any questions. We are located on the Historic Lake Clifton High School Campus, 2801 St. Lo Drive, Baltimore, MD 21213. Visitors can park in the lot next to the three hoophouses at the front of the farm. Please visit our contact page for driving directions. Urban soils can contain pollutants related to the land’s former use. We are continually testing for soil contamination and will keep visitors safe by containing all service learning groups in the safest spaces. Feel free to contact us with your questions or concerns.